As some of you already know, my site recently crashed (and burned). Thanks to some help from my family and friends, my readers, my fellow bloggers, and my techie friends, I am in the process of restoring all of the content from the old Vintage Victuals. I have all my recipes, writing, and photos stored in Google Reader and will be slowly re-posting all of your favorite VV recipes. Unfortunately, I am unable to restore the wonderful comments that you all shared on each of my posts, but I'm sure we'll build those back up over time. Please bear with me as I work to restore VV to its former glory. Thank you for your patience and your support! This is the most wonderful, moist, dense, and deliciously cozy cake you have EVER put in your mouth. The perfect end to a hearty winter meal. 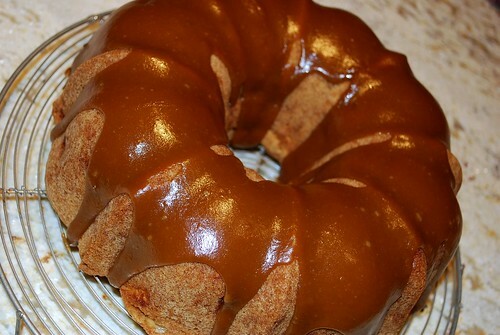 This recipe comes from my mom’s sister – my sweet Auntie Heather. She is another one of the many great cooks in my family, so watch for more recipes from her in the future! 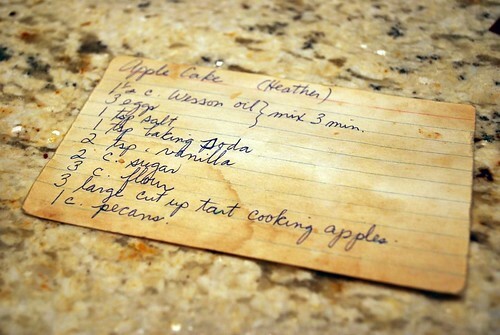 You can tell how much we love this recipe by how worn and stained the recipe card looks. Preheat oven to 325 degrees. Grease and flour a large bundt pan and set aside. In a large electric mixer bowl, beat vegetable oil and eggs on high speed for 3 minutes. Add the salt, baking soda, vanilla, sugar, and flour, and blend on low speed until incorporated. With a wooden spoon, fold in apples and pecans. Pour batter into prepared pan and bake for 1 hour and 20 minutes, or until toothpick inserted into center of cake comes out clean. Cool for 10 minutes in the pan, then turn out onto a cooling rack and allow to cool completely. Put all ingredients in a small saucepan, and place over medium-low heat, stirring until melted. Increase the heat and continue to cook until mixture reaches a boil. Allow to boil for one minute. 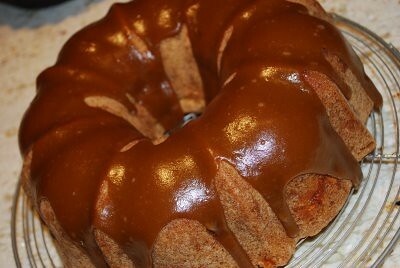 Remove from heat and allow the glaze to cool for 20 minutes so that it can thicken. 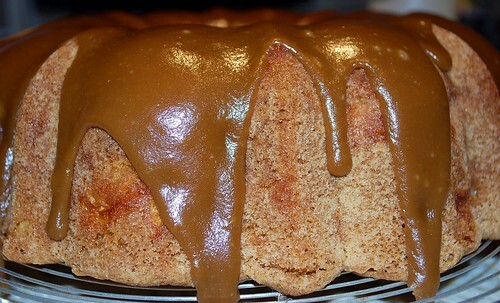 Then spoon it over the cake so that it drips lavishly down the sides. ©2009 Vintage Victuals. All Rights Reserved. Blog Designed for Blogger by Lena and modified for Wordpress by JudithShakes Designs.